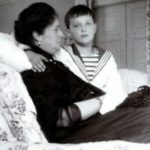 Due to the Pauline Laws of Succession set in place by Emperor Paul I in the 18th century, only the eldest son of the reigning monarch could inherit the Romanov throne. 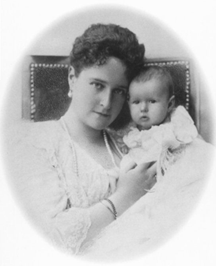 Despite this fact, and although the Emperor and Empress fervently prayed for a male heir, the birth of their 4th daughter was welcomed with much joy and love, just as the births of their three eldest daughters, Grand Duchesses Olga, Tatiana and Maria were. 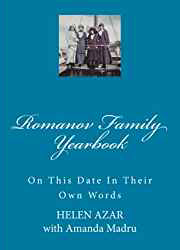 When the fifth child was born, the family welcomed a son and named him Alexei. 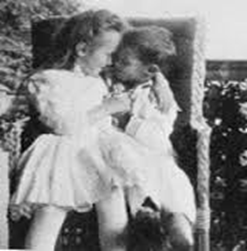 Anastasia, like her older sisters, were completely devoted to him and showered him with both sisterly and motherly affection. 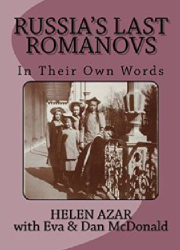 Contrary to popular opinion on how a Princess or Grand Duchess is believed to be brought up, the children of Emperor Nicholas II, who was the world’s most powerful man at the time, were raised very simply and modestly. 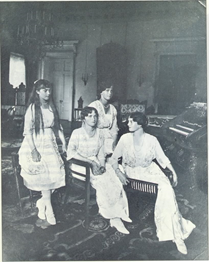 Anastasia shared a bedroom with one of her older sisters, Grand Duchess Maria; the two were dubbed “the Little Pair”, whereas the two eldest sisters, Grand Duchesses Olga and Tatiana were dubbed “the Big Pair”. Her sparsely furnished bedroom, complete with a cot on which she slept, was decorated with purple butterflies. 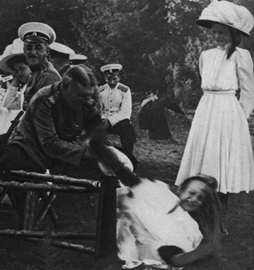 There was no idle time for the children of the Russian Emperor. Their days were strictly scheduled. They awoke early in the morning, shared their meals, and this was to be followed by their lessons and of course, prayers. 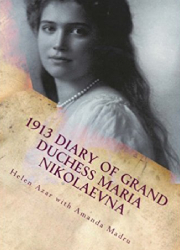 Their mother, Empress Alexandra Feodorovna, granddaughter of Queen Victoria, was raised under the influence of an English nanny. There was to be no idle time. Industry produces both a healthy body and mind. 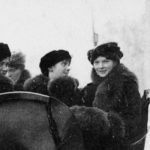 Although these four girls were Russian Grand Duchesses by birth, they were sisters by heart and very typical of what sisters were and are and they shared everything. 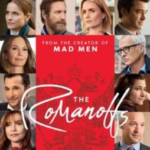 Anastasia and the family immensely enjoyed the welcoming and temperate climate of The Crimea, where the breathtaking Livadia Palace, surrounded by tropical palm trees and overlooking the warm waters of the Black Sea, was a welcomed respite to the intense pressures of Moscow and St. Petersburg. Most certainly Anastasia would be delighted in the fact that The St. Peter Line, a ship that presently ferries vacationers from St. Petersburg to surrounding ports, named one of their ships the ‘Princess Anastasia” in her honor, complete with a large portrait on board of the young teenage Grand Duchess. 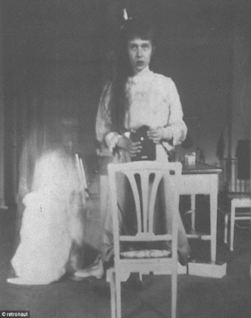 Anastasia’s name means “she who will be resurrected” or “she who will rise again” but she most certainly lived up to her nickname “The Imp” and “Shvybzik””. She delighted in all things nonsense, silly and fun loving. 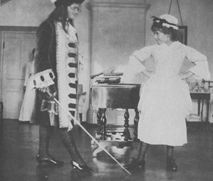 She was a master mimic and some remarked that she was destined for the stage! She thought so too and if the stage wouldn’t have her, the local chimney sweep and co. was her second career choice, so she once firmly stated to her frustrated tutor. 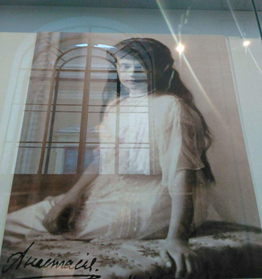 Grand Duchess Anastasia showing off her art. 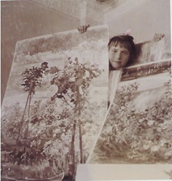 She was a master mis-speller, a voracious reader, favoring the Bronte sisters and Dickens, fluent in Russian, French and English, enjoyed photography, as did the rest of her family, played the piano, sketched, and of course, painted with Aunt Olga Alexandrovna, who nicknamed her “the little one”. 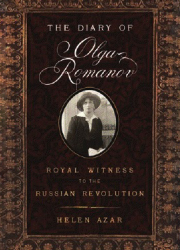 She loved putting on plays, especially when the family was imprisoned. 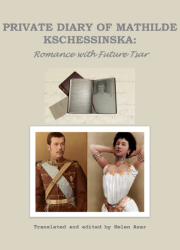 She was a ray of sunshine during those long and dark days in Tobolsk and Ekaterinburg. Even the earlier guards were amused by her antics. Her blue eyes always held that singular sparkle of mischief, which was to define her exuberant personality! She was a tomboy and loved to climb trees, purposefully trip servants and melt chocolate in the pockets of her formal dresses. Once that chocolate melted, Anastasia would take her white-gloved hands and retrieve them. Her parents were not amused but her audience most certainly was! Did you know that she had a scar on her forehead due to an accident? She was sensitive to it, hence the hair fringe that covered it. 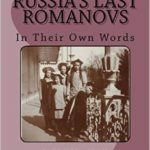 She loved to weave flowers and ribbons through her strawberry blonde hair and this later became quite the rage in Russia! She was quite impressed with her trend-setting fame. 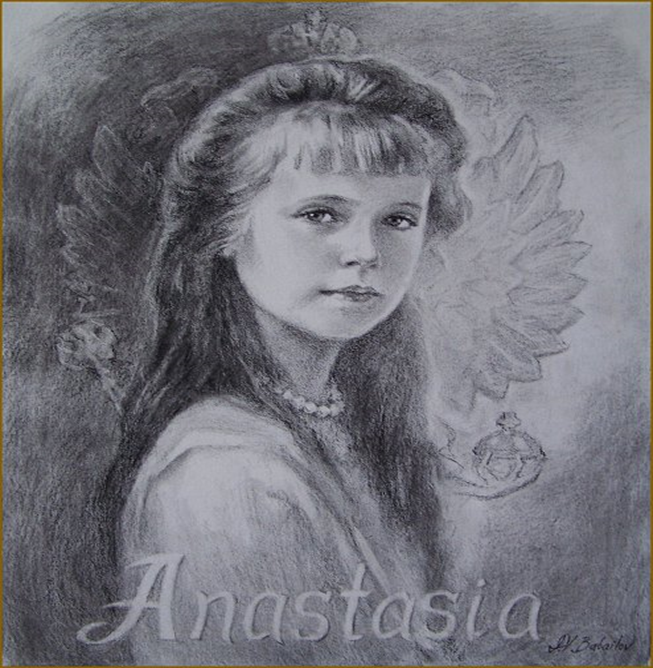 “Grand Duchess Anastasia, the free spirit! 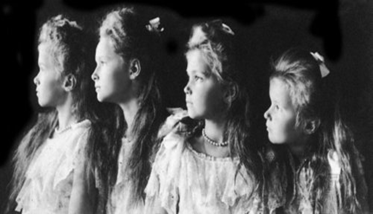 The daughters of the Emperor were the most photographed in the world and their star status can be likened to that of Diana, Princess of Wales of our not too distant past. 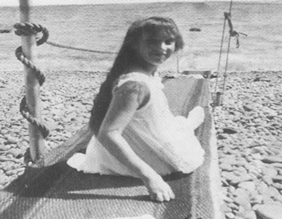 They were known by all to be sincere and down to earth girls. Their humility and genuineness is most certainly a credit to their upbringing. 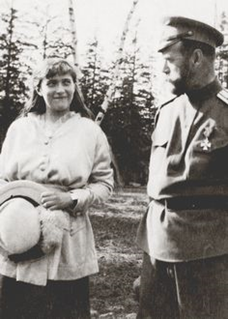 In a time when children of privilege rarely saw their parents and were raised by nurses and nannies, the Emperor and Empress were very hands-on parents. She had no tolerance for pretension. When the ‘esteemed’ came to visit her Papa at the palace, she would roll her eyes at them as they flourished past, then the tongue would stick out behind their backs. It is said she would do the same to the guards when the family was held in captivity. Her innocent defiance at its best! 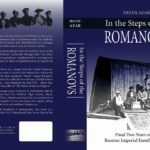 When the Great War broke out in 1914, the family sacrificed, as did their subjects, and committed themselves entirely to the welfare of the nation and the troops who defended it. 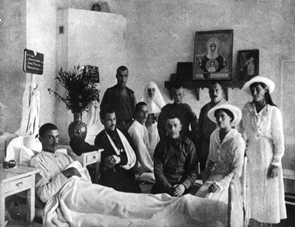 Anastasia’s mother and two eldest sisters trained as Red Cross nurses, tending to the wounded in their own hospitals. 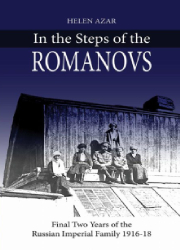 Anastasia was too young to train as a nurse, like her sister Maria, but both visited the infirmaries to cheer up the soldiers, help them write letters home and play a game of chess; Anastasia even taught some soldiers how to read. 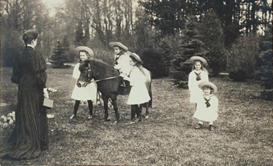 One of the last official photographs of Grand Duchess Anastasia and her sisters. After her beloved Papa’s forced ‘abdication’, the family was placed under house arrest. Anastasia was just a teenage girl. She committed no crime. Her name, family, faith and nation that she held so dear was hijacked by forces of pure evil. The quiet early days of captivity were followed by emotional and psychological suffering. It was the love, faith and commitment this family had for one another that sustained them through the dark days of their calvary and road to martyrdom. 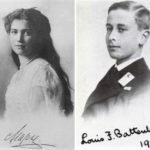 The family was together on that fateful tragic night of July 16-17, 1918 and they were all to enter the Kingdom of heaven into the arms of God as one united family…it was in heaven as it was on earth. “Tobolsk. 12th/25th April, 1918. My dear Papa! May the Lord and all the Saints protect you, my dear and beloved Papa. In our thoughts and prayers we are always with you. I cannot even imagine how we can be without you. I believe and hope that the Lord will help us all. Good night my precious and wonderful Papa. I send you a thousand big big kisses times, as big as my love is for you. May the Lord be with you and bless you, darling. Your loyal and devoted, Shvybz / Anastasia” The Russian Orthodox Church canonized Anastasia and her family as passion bearers in the year 2000. A passion bearer is “one who faces death in a Christ-like manner”. 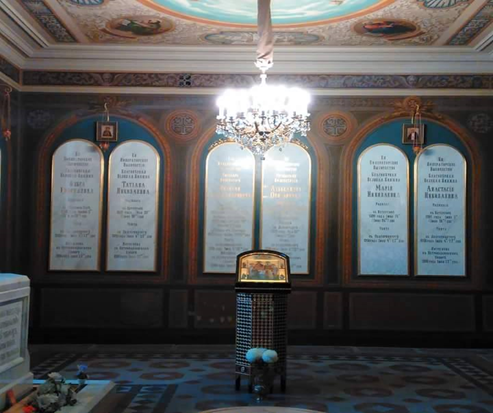 Tomb of the last Russian imperial family in St Peter and Paul Fortress, St Petersburg. 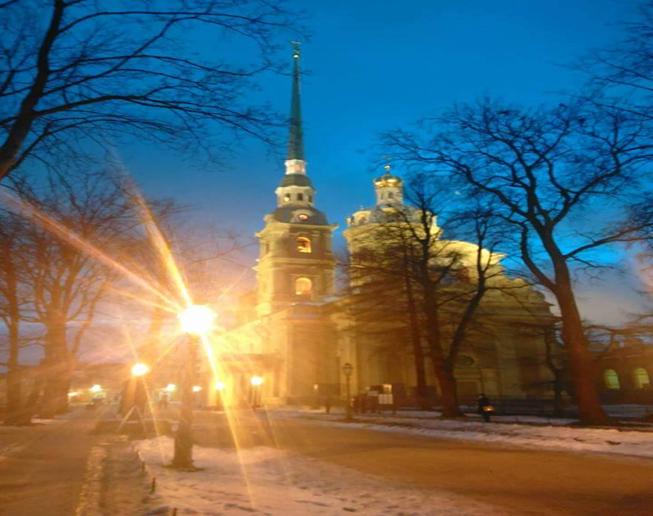 We are still not yet certain if Anastasia is one of the daughters that are now interred with 5 of the family members in the Cathedral of Saints Peter and Paul in St. Petersburg. 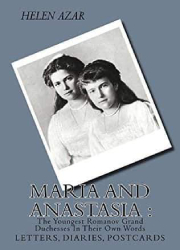 There is still some confusion as to whether it is Anastasia or her older sister, Maria. We all hope in due time this mystery will be solved. Only 17 years old. 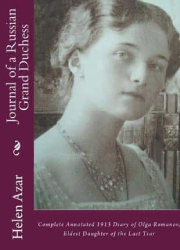 Her spirit will live on… Due to the inaccurate movies and cartoons whose theme centers upon Grand Duchess Anastasia and her ‘survival’, many are unaware of her true story. We hope to dispel these myths and legends by our work here and elsewhere. Anastasia deserves historical truth and justice. 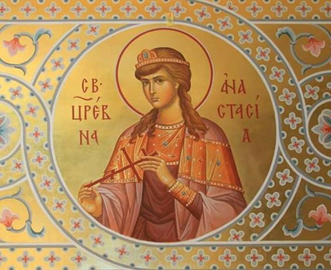 She is a Passion Bearer in the Orthodox faith and deserves the reverence owed to one who faced death in a Christ-like manner. God bless you Princess. Eternal memory to you! 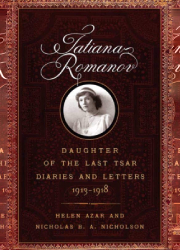 Thank you for this wonderful and moving tribute to my favorite Romanov girl! Every year on her birthday I always try to remember her and say a silent prayer for her in my heart! 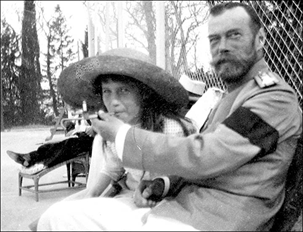 I adore the entire Romanov family but I especially love Anastasia! If I had been blessed with children I would have wanted a daughter exactly like her!